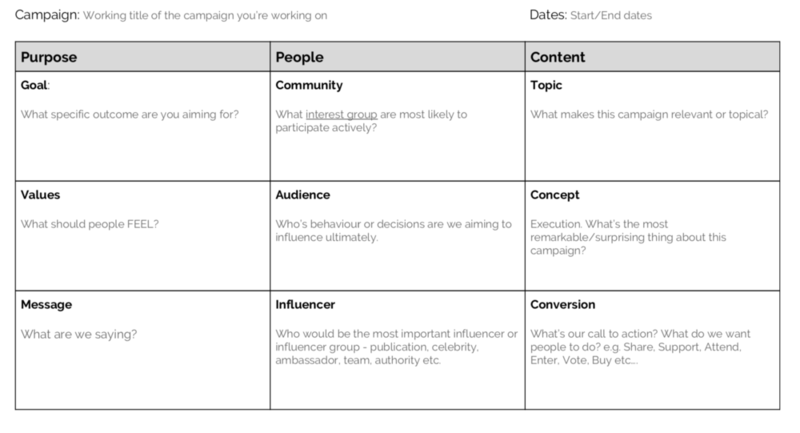 The social campaign canvas one-page framework that coaches you through 9 considerations to create an event on social media that gets noticed and delivers business value. This post explains how the canvas works, and at the end you can click a button to download the .pdf to print out and use. Business Purpose corresponds with Content Conversion - i.e How do you ensure your content delivers on your business objective. Your Partners need to correspond with the Community - Partners give you access to your community, can give your credibility in that community, and help you with messaging and concept for the community. Your Values need to be expressed clearly in the creative Concept, this gives emotional consistency and depth to the campaign. Your Message is what you want to say, the Topic is what people are interested in talking about. Ultimately, you need to combine the two to ensure your message gets through in a way that's interesting a relevant. And at the centre of the canvas are your Audience. The reason we're doing the campaign is to get them to act, and so everything on the canvas should relate to them and what is most likely to work. In his talk Dave shares some of the methods that we at Treeshake have used to run campaigns that have reached over 1b people this year.